Sometimes it’s the simple details that make something attractive, and that’s certainly the case with the Farmington style louvered cupola. This square roof cupola is made for roof pitches up to 10/12, so it fits most standard rooftops on homes, barns, commercial buildings and other structures. 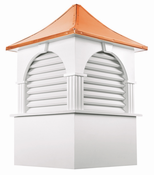 At Millworkcity, we’re proud to carry the Farmington roof cupola in several sizes. Whether you’re adding it to a small structure or a large one, you’ll find what you need in our extensive inventory. Our stellar customer service keeps our patrons coming back, and if you haven’t worked with us before, we look forward to welcoming you into the Millworkcity family. Our expertly crafted Farmington® louvered cupola features timeless American style. Measures 26” W x 39” H. Builders rule of thumb: 1.5 inches of cupola width for every foot of unbroken roofline. Measures 36” W x 53” H. Builders rule of thumb: 1.5 inches of cupola width for every foot of unbroken roofline. Measures 42” W x 63” H. Builders rule of thumb: 1.5 inches of cupola width for every foot of unbroken roofline. Measures 48” W x 74” H. Builders rule of thumb: 1.5 inches of cupola width for every foot of unbroken roofline. Measures 60” W x 94” H. Builders rule of thumb: 1.5 inches of cupola width for every foot of unbroken roofline. Measures 72” W x 109” H. Builders rule of thumb: 1.5 inches of cupola width for every foot of unbroken roofline. Measures 84” W x 123” H. Builders rule of thumb: 1.5 inches of cupola width for every foot of unbroken roofline.